· Thursday Racing Park Pakenham. Will include also some interstate races. Join today, only $20 for a day’s great tips. New members don’t forget to forward your mobile number. Race Data V’s 28.8 Fitness. say No to this horse and no to that horse. so many of our winners. they were on the wrong track. losing; 28.8 is the place to visit. 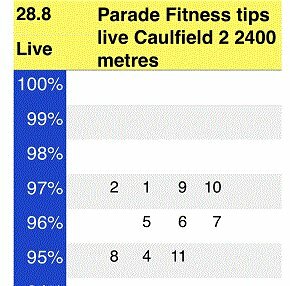 1 ,000's of punters are now adding our fitness into their data spread sheets to complete their data base. Live SMS mobile to members may be Tuesday, Wednesday, Thursday and Saturday. excellent on Saturday where we did 12 races. live fitness% tips, the best in the world. Morning punters 28.8 right on the ball for members with winners around the globe. and spacing the day out nicely with a coffee break after Race 5 @ Caulfield. 2nd tip and again many more exotics. All good news for members on our SMS mobile service. Buffering wins @ $11 in Dubai after rating his midweek trial form on 99% fit, great effort. 98% fit, he run unplaced. Great day all round and members very, very happy. SMS live next week some time, stay tuned. Massive day for members, did 12 races, winners everywhere, exotics everywhere. I think I got 6 winners on top and another 4 2nds pick won, then the other 2, no dramas. Money money money and $1,000's in exotics. Break time top rated winners everywhere.